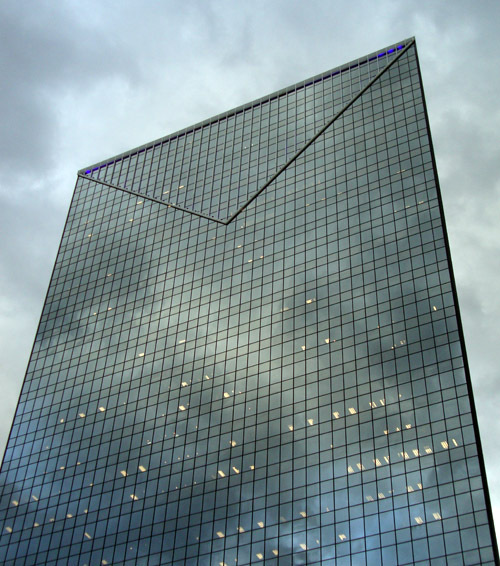 It's difficult to believe that one of the more modern-looking buildings in downtown Atlanta was actually built in 1975. Centennial Tower, formerly known as Marietta 101 (for its street address), underwent a major renovation, inside and out, that left it a trademark building in the Atlanta skyline. From what I've read in my research, when the chevrons were added to the top of the building during its 1998 renovation the total height was increased by 13 feet and the dramatic lighting of said chevrons makes it uniquely distinctive at night. To see how beautiful it is on the inside, check out the Jackson, Oats, Shaw virtual tour or you can always pop into the sleek, contemporary first floor restaurant Thrive and enjoy the euro charm of this upscale yet casual dining destination (it really looks like a lot of fun...I want to go!). When I snapped this photo, I was downtown buying tickets to an Atlanta Thrashers game and clouds were coming in very quickly. Skyscrapers in cloudy downtown Atlanta at sunset can look rather ominous...and cool at the same time.